In what was likely the most considered outfit of her life to date, Meghan Markle donned an elegant forest green dress to announce her engagement to Prince Harry to the world’s media. Symbolising growth and renewal, could the choice of dress have been Meghan’s way of saying that she is ready to begin her new life as a member of the British monarchy? 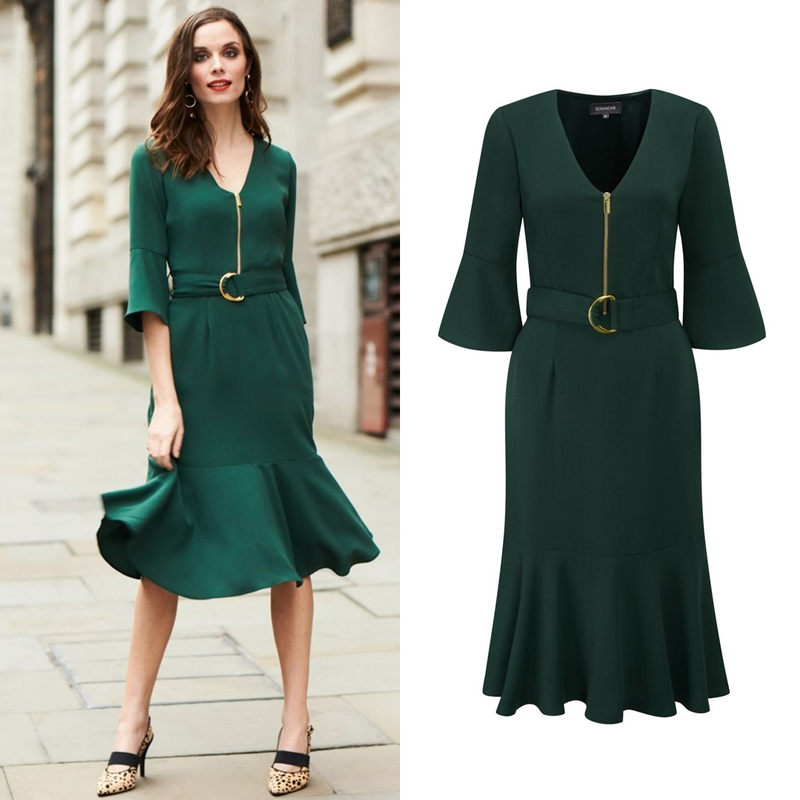 Like her future sister-in-law, the Duchess of Cambridge was also spotted in a beautiful forest green shift dress last month – meaning green is now the shade to be seen in this season. It cropped up on the catwalks too, as part of the wider trend for all things Crayola coloured, making it the obvious starting point for injecting a hit of new season freshness into your wardrobe. While the other hotly tipped colours of spring – bright pinks and reds or pastel lilacs and yellows – feel a little premature in February, green, from royal favourite forest to emerald, is the perfect transitional hue. It looks good in spring, summer, autumn and winter, meaning maximum cost-per-wear value. Plus, it suits all skin tones and hair colours. And no, that’s not a sweeping statement – for proof, look to the parade of celebrities who’ve rocked the shade recently; Reese Witherspoon, Julianne Moore, Christine Lampard and Elisabeth Moss. To name a few. Reese Witherspoon recently rocked a fishtail hemmed green frock on the red carpet. For a real life-friendly take, try our elegant day-to-night d-ring style. Since knitwear weather is going nowhere soon, update your collection with our jewel green jumper. With frilled sleeves and a décolletage-flashing asymmetric neck, this is not your average knit. Clearly taking style cues from her soon-to-be sister-in-law, we spotted the Duchess of Cambridge in a forest green shift. The luxurious hue – and double fluted sleeves – elevate the simple and easy to wear shape to statement status. While the black leather biker will always have a place in our heart (and wardrobe) this season we’re smitten with it’s equally versatile green sister, and we think you will be too. The sophisticated shade allows you to be a little more playful with your design details; cue waterfall ruffles, flute sleeves and knee-skimming fit & flare hem. Wear it day and night. Our favourite thing about forest green is that it can look as polished or as laidback as you like. Elevate our blouson sleeve dress with heels or dress it down with your go-to weekend trainers and a leather jacket. 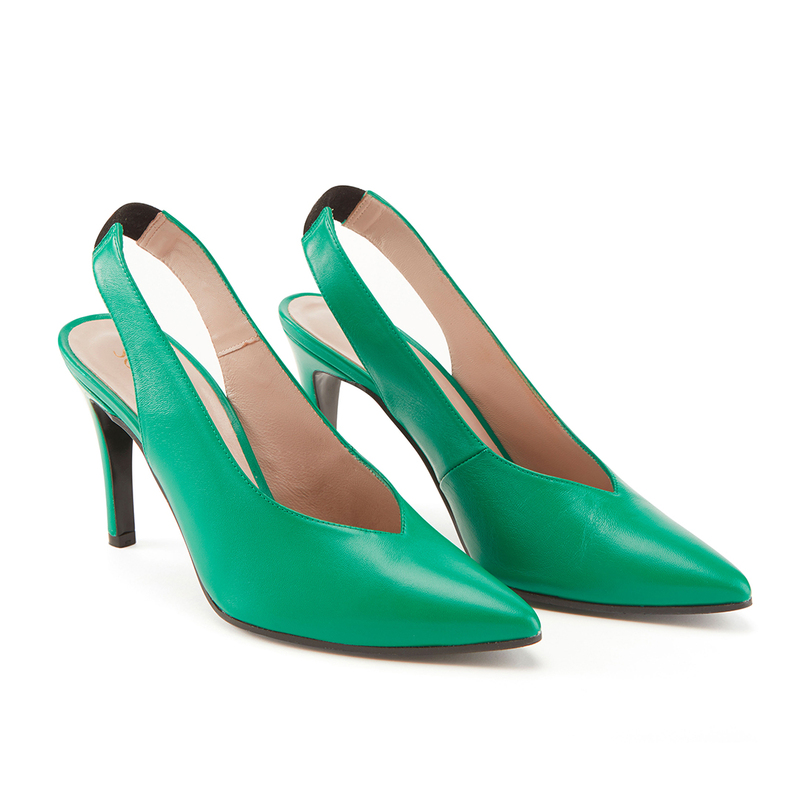 These gorgeous pointed-toe slingbacks will add major style points to any outfit you wear them with. Plus, the clever elasticated heel strap makes them super comfortable.